When I look at the world we live in I like to think that as a species we are evolving, even though at times it seems to be painfully slow. Each generation becomes more and more tolerant and open to things not familiar and not status quo. The number one issue facing humanity is just our ability to get along with each other. There is not a place on earth in which people are dying, because of their race or the gods they worship or because of the person they choose to love. Amazing that a simple little flash anime such as this can manage to sum up everything so sweetly that one hundred times longer can’t. For a story with no dialogue, the message of There she is!! comes across loud and clear. All of its episodes are told as though they were music videos. One doesn’t even need to know what the lyrics are to understand exactly what is going on. 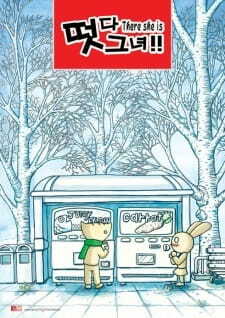 The series starts out innocently enough, with a cat and a rabbit meeting at a vending machine and the rabbit developing a humorous love at first sight with the cat. Despite his struggles to get away and let her know that cats and rabbits shouldn’t be together her devotion is unwavering and absolute. The first couple of episodes are sweet and cute and totally enjoyable to watch. Suddenly when the third one rolls around the message comes into focus. I was completely surprised but it as well. You can pretty much relate the struggles of the budding romance between the cat (latter named Nabi) and the rabbit (Doki) with any form of bigotry. Forbidden romance of either interracial, gay and lesbian, or ethnic backgrounds it all seems so silly and pointless to get so upset over. Honestly I wanted to laugh, cry and scream with anger all at the same time. Everyone should really love the two main characters Doki and Nabi. Even though a word is never spoken their feelings come across clear as day. It’s a bit of a sad indictment of anime though that a series like this came come across as a great romance with great characters and have a running time of barely thirty minutes. It actually is possible to have a real relationship without all the blushing, angst, and harem drama. The music is quite important to the series. The songs are all upbeat for the most part and fit the style of the animation and the mood nicely. Understanding what’s being said is not really that important though it’s unfortunate that a karaoke version of the songs was not available in the copy that I viewed. For animation done completely with flash you would expect something crude and not all that interesting. You would be very wrong though! The only other flash animation anime I have seen was a series called Hanoka, and while it had some pretty decent and complex art, the simplicity of this series is its strength. Sometimes less is more and the character models are animation couldn’t have been better. I would even go so far as to say that if it was remade and animated with the very best CG effects and art that it would never be as good as this version. Overall this was a series that took me a bit by surprise with how much I really enjoyed it. It goes to show that you don't need fancy artwork and animation or even dialogue to leave a powerful impression. There she is!! is something everyone should see. Don’t argue with me, just go out right now and watch it. I first started watching it because my friends where saying how much they loved it. So I looked it up on YT and suddenly fell in love with the sad and sweet story that I absolutly adore. The story was so great, the first part was sweet, I think Doki is adorable and I understand why she fell for Nabi. I never notice the signs until the last episode. Then when the story gets sad I feel their love, its just so cute. The art was great because you can see the point so clearly, the person knew what they were doing. The sound, even though I couldn't understand the words of the songs I heard it still made me know what was happening. Everything made sense, I muted it once and understood why the sound was there. To help you realize what it means. Though it usually does I was just experamenting. The character, oh this, the person who made this was clearly very good at story telling without words. The scenes clearly pulled the entire thing together, I could understand it so well. I enjoyed this to the max, I don't know very many anime that can touch you so much. Do you ever watch something that blows away your expectations completely? When I was watching this short series, I was blown away by how something so simple can be so complex at the same time. When I watch a flash cartoon, I expect something funny, silly, and sometimes downright vulgar. Typically, flash animation is not very provocative...however, this series stepped into that fray and did what most flash animators fail to do...tell a captivating story. The story primarily revolves around a female rabbit named Doki who meets a male cat named Nabi at a vending machine. She immediately becomes infatuated with him while he tries to avoid her knowing that it's socially unacceptable for a cat and rabbit to fall in love. In theory, it's a pretty simple story, but the societal issues of the story really pull at the heart strings when it comes to their relationship and really give the story life. First of all, the entire series has zero dialogue. All that is shown are voiceless, animated characters in motion to the sound of music. It's the classic example of how a picture tells a thousand words because each episode is 3-5 minutes, has no dialogue, and tells a beautiful story of romance, friendship, and societal views and change. The music plays an integral role as it essentially tells the story with no dialogue. Even if you can't understand the music, the tone it sets along with the flow of the story helps set the mood. Secondly, I was absolutely stunned at how it approached the topic of intercultural/interracial relationships in society. While I'm not sure how it is viewed in Korea (the origin of the cartoon), in the United States, intercultural and interracial relationships were taboo for quite a period of time. Among some cultures and societies, it still is, but generally speaking it is more socially accepted now. While it is more socially acceptable now, there was a time when it wasn't and you could argue explains in some nice detail about how that sort of society works. With that being said, I could argue that there are some pretty minor flaws. The series really didn't go into much detail as to WHY these relationships are taboo. In most cultures, there's usually a good reason...some reasons being because of a superiority complex...some being political reasons...and so on and so on. Here's a really minor complaint for me but I really felt like this was too short. There really wasn't that much "character development" between Doki and Nabi...as well as with the side characters. It's so vague in parts that I had a difficult time trying to connect the Jjinta Set (the three thug rabbits) and their relationship to Doki. However, I will say this...the character development that is there...is FANTASTIC. I'm not sure if this was only 5 episodes equaling 23 minutes in length because the story ended there...but I can assure you there's more to this story that can be told in more than 23 minutes. A minor complaint that I had that I didn't use to affect the score is I really wish there were English subtitles for the songs. Perhaps there are and I haven't found them but it really would help out in regards to understanding the minor nuances within the story. I'm going to come out and say this right now. Of all the flash animated cartoons I've ever watched, this series is the best flash animation series...EVER. I enjoy my share of flash animation cartoons, mostly for comedy. However, I've never seen one that's had such a captivating love story with the addition of social commentary. I will admit, I shed a few tears watching this and considering that was done by flash animation, that's impressive. I will admit, the first two episodes tested my patience a bit. I liked them, but didn't necessarily love them. The third episode is when the ball really got going for me and by the fourth and fifth episodes, I was in love with this series. I would recommend this series to anyone that's ever found themselves in an intercultural/interracial relationship, whether it be love, friendship, or even on the political spectrum to give this a watch. It's deep despite it's simplicity and it really shows how the power of love can change friendships and how it can change society for the greater good. “There She Is! !” is a five-episode ONA in which each episode is about five minutes long. The premise is a female rabbit falls in love with a male cat in a society that rejects the idea of interspecies relationships and how they cope. There is no dialogue at all in the series, but each episode stars a song that matches the mood of the episode. What I loved about the story was despite the short length and lack of dialogue, there is a strong story and good character development. The moral of how all love should be accepted is strong and presented well, and it’s still relevant today. Then there are the characters. Our leads are a female rabbit, Doki, and a male cat, Nabi. When the first meet, Nabi is against the idea of challenging society but eventually gives in. After several dates, he starts to fall in love with her. During the rising action, Nabi is becoming overwhelmed from the fighting between protesters and supporters, but Doki stays strong. In the end, they fall back in love. Their perseverance through their trials, errors, and successes is heartwarming. That’s not to exclude the side characters. There isn’t much to say about them as they aren’t the main focus, but the few distinct characters within are very supportive of the relationship and cause making them likable. There isn’t much to say about character except for there is strong development (better than some anime). The only thing to talk about for sound is the music and that does not disappoint. Each song fits the tone of the accompanying episode. The songs I liked the most were in episodes 1 and 4 (as well as the story points in those episodes). Episode four especially conveys the distressing atmosphere of the war between the protesters and the supporters and the relationship of Doki and Nabi stuck in the center of it all. The animation is done with flash, but it fits the short in a sense. It has an innocent appearance which, I feel, further appeals the powerful message within. It’s nothing noteworthy, but it’s cute. Overall, it is a phenomenal piece of art with good music, likable characters and story, and a beautiful and powerful message: all love should be accepted. Do I recommend it? Yes, yes I do. I don’t care how old you are, take 20 minutes to sit down and watch this ONA. It can be found on YouTube.